Although most of the time people use backpack for carrying the accessories, foods and gears during kayaking. But using a kayak deck bag for kayaking purpose would be great, because it can be designed with a specific shape, waterproof or water resistant compartments, extra cord for storing additional items and extra straps, hooks or buckles to perfectly tie down the bag with any kayak. A kayak deck bag also can save the space of your kayak and you can enjoy an easier access for the items you stored in it. Moreover, a waterproof deck bag also can be a great protection for the stored items, because the water wouldn’t be able to harm the items of the bag. So you want a kayak deck bag to safely carry your necessary things during the kayaking?. After researching and testing finally we are representing the five best kayak deck bags. Any one of the below would be a great pick for carrying your necessary accessories when you enjoy kayaking. The Chinook Aquatidal 25 is designed with a great shape and high quality water resistant materials. This lightweight bag has the durable TPU coated ripstop nylon for the extra protection while the non-corrosive zippers are rugged and guaranteed to use for years. The bag includes a large compartment and several mini compartments to hold almost all of your accessories and items you need to carry. The main compartment is composed of water resistant materials that ensure an amazing protection for the gears. As well, the large sized compartments on the side are great for safely keeping the bilge pump and water bottles. And after setting everything in the bag you can simply attach the bag to kayak decks. Even if you want to use the bag for other purpose, then you can attach the shoulder straps that afterwhile can make it a handy carry bag for other purpose. The Advanced Elements Quickdraw has the removable interior roll top liner where you can safely place your items and release them easily by removing the interior roll top liner. The PVC tarpaulin construction of the bag provides an extreme durability that is also water resistant as if it can perfectly resist the water. The bag hasn’t any side compartment, but the large and high quality main compartment is enough for the optimal safe of all basic items. Moreover, the water resistant zipper of the bag maximizes the protection level for all the items inside you stored. And finally the contoured shape of the bag provides a great visibility for the interior roll to liner. Moreover, the bag has adjustable straps and d-rings to securely adjust the bag with your kayak. The NRS Taj M’Haul is a perfect invention to protect your stuffs from the water as the bag features an inner bag that is waterproof and made out of infinity bomber polyurethane. It has hydrolock zip closure for a perfect level protection from the water. So when you are kayaking the splashes of the water are not going to damage any item. As well, to hold some additional gears it also has outer pocket and zippered mesh pocket for a secured storage and easy access. On the other hand, the bungee lacing on the bag also can hold the paddle, bilge pump and water bottle as you can get access for these necessary items in seconds. Moreover, the bag includes a plastic insert for the perfect shape and to ensure the perfect visibility for all time it has plastic tape that works as the visibility. The bag is designed with the hooks and straps to properly adjust it with the kayak. 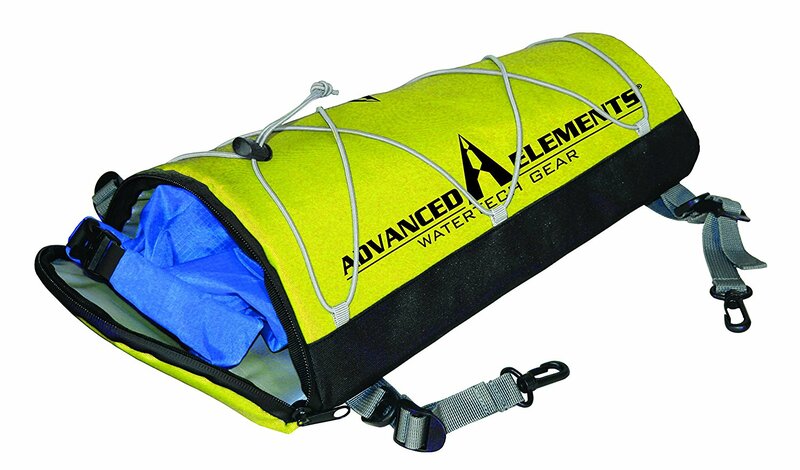 The Attwood Kayak Deck Bag is a durable and high quality water resistant deck bag that has a large 8 liter water resistant compartment. The large shell of the bag is made of durable nylon PVC that is yellow colored to maximize the visibility in low light. So you can enjoy a comfortable kayaking in any condition of the weather with a great visibility. The bag added its storage ability by adding bungee straps that are suitable for holding additional stuffs. On the other hand, the quick snap hook attachments are very useful to securely attach the bag with the bungee of the kayak and the D-ring attachments also can work to tie down the bag very safely. So if you use it to carry the necessary stuffs you want for kayaking, then you shouldn’t have any fear to get them safely whenever you need. 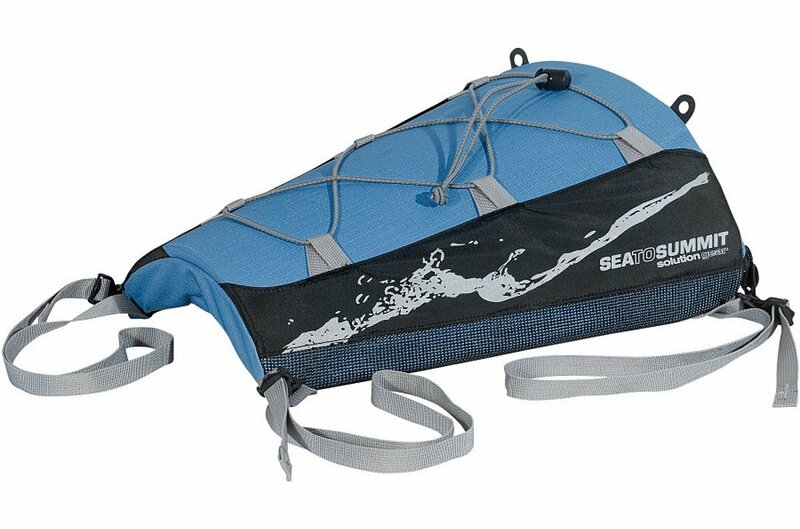 The Sea to Summit Solution Access is a perfect bag to use during your kayaking that has an attractive shape to properly attach with the kayak. The abrasion resistant hull of the bag is durable that has been made of 450D PU coated ripstop nylon for the lightweight and durable construction. 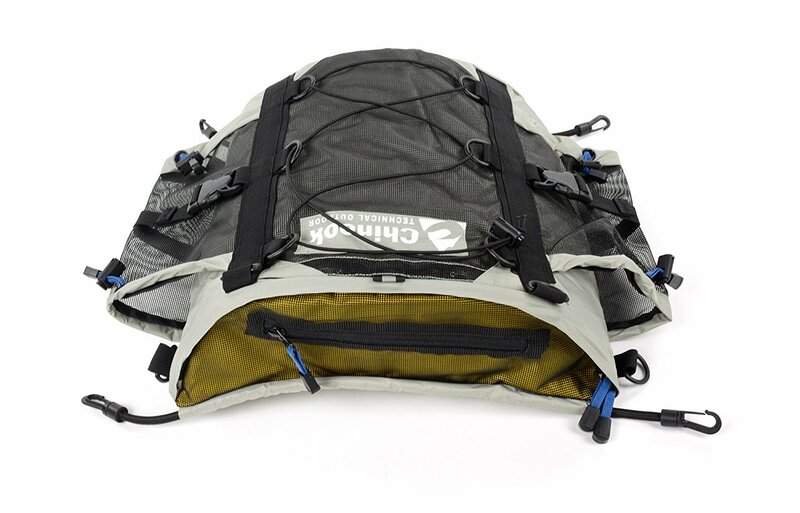 The bag includes four straps to greatly tie down the bag with kayak shape while the waterproof design with Hypalon roll top closure system can ultimately save the things of the inside from the water. 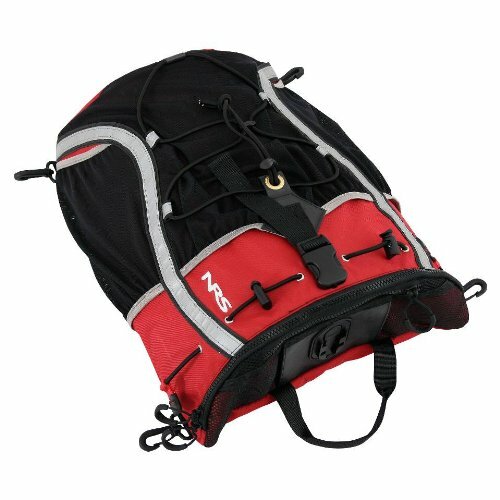 Moreover, the two mesh bags on the side are great for storing the water bottles or mini gears and the shock cords on the upper side can be used for additional storage like bilge pump, life jackets and kayak pedal. Like choosing a backpack, you should also consider a few things before picking your kayak deck bag. 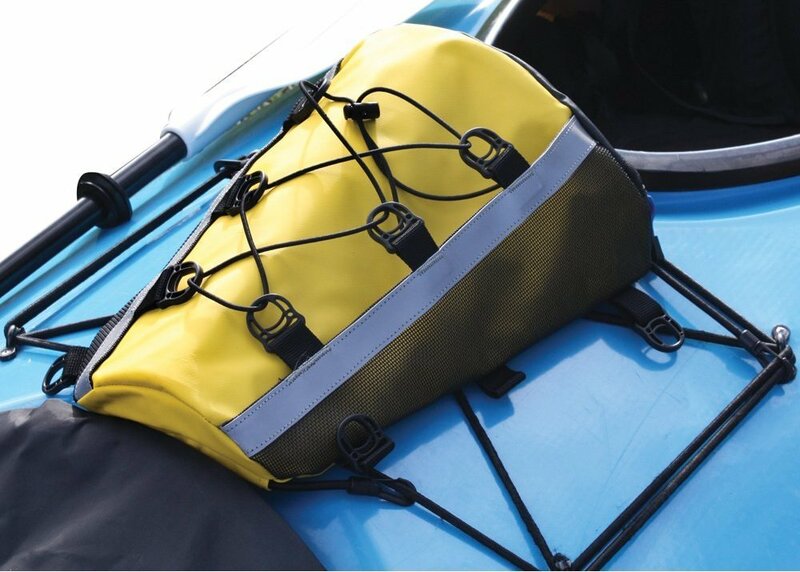 Materials: Without durability a kayak deck bag won’t be long lasted. So you have to know the type and quality of the materials. As I see the nylon materials based bags are very durable and water resistant, but the fibers can be soaked by the splashes and if it becomes heavily soaked, the items of the bag would be soaked by the water. So if you use a nylon material based bag, you have to be careful as if the bag doesn’t fall in the water. On the other hand, the PVC tarpaulin or vinyl based bag can ultimately protect the items from the water. But these materials aren’t durable like nylon. But when it comes to save the items from the unfairness of water, then the PVC tarpaulin or vinyl is great. Number Of Compartments: Although every deck bag must have a main compartment, but having some additional compartments will work as a great option for putting the bilge pump, water bottles or other accessories. Especially the compartments with mesh on the side or bungee cords on the upper side of the bag are useful for holding these stuffs. Because you can easily get access for these very necessary stuffs without unzipping the bag. Straps and Buckles for Tying Down: The kayak deck bag is mostly designed with a specific shape to properly adjust it with the kayak’s deck. But if you don’t tie down the bag with the deck, then the bag can anytime fall down in the water. So the straps with buckles or the hook will work to tie down the bag perfectly with the kayak. Most of the deck bag can include these things, but make sure the one you are going to pick that has these things. No doubt, the kayak deck bags are very kayaking specific and work more efficiently than a backpack. The fishing backpacks or other backpacks may be efficient for other kind of use, but when it comes to choosing a bag for kayaking, of course, you should pick the kayak specific bag. Because, these bags can save the space of your kayak and you can easily carry the accessories, foods, gears, water bottle and bilge pump without any effort. On the other hand, these bags can save the things from the damage of water and you can securely tie down the bag with kayak to ultimately protect the items from unfairness.